After the climb we spent a few days at the Kinabatangan River in Sabah watching the incredible wildlife diversity there. This was our first encounter with the Bornean Orangutan and the Bornean Pygmy Elephant; thus began our addiction to Borneo. That was in 1998 and it was enough to put the hook in them; they’ve been returning regularly ever since. A Visual Celebration of Borneo’s Wildlife is a photographic tribute to this captivating island and its unusual fauna. But it offers much more than a coffee-table experience of flicking through images. The photographs are accompanied by blocks of text providing more than mere captions; more than a visual celebration, there is genuine scholarship here too. There are chapters dedicated to the various habitats found around the island and specific destinations within them. Introductory pages pay tribute to the great naturalists of the region: Alfred Russel Wallace, John Whitehead, and Charles Hose. The depictions don’t focus only on the spectacular and celebrated animals of Borneo, but also direct attention toward the lesser-known. There are chapters covering marine fauna, invertebrates, amphibians, and the botanical wonders of Borneo as well. Bornean Crested Flameback. Bjorn Olesen. Used with kind permission. We have worked with Fauna & Flora International in Southeast Asia on a pro bono basis since 2013, and we are impressed with their conservation work in the field. FFI was founded in 1903 and is the world’s longest established international conservation body, working now in more than 40 countries around the globe, mostly in the developing world. For conservation projects in Borneo to be successful, it is now recognised that the involvement and participation of local people and communities is integral. It is imperative to find ways to generate some form of economic benefit from the ecosystem and doing so in a sustainable manner. In other words, conservation needs to be linked to improving the standard of living of the local people, so that they have a personal incentive in sustaining those conservation actions. It is here that ecotourism has an indispensable role to play for the continued existence and well-being of the natural areas and their wildlife in Borneo. In Sabah, Borneo eco-tourism has been particularly successful and is employing a substantial number of local people and attracting international investments. However, it is a long battle as for instance the palm-oil companies in Borneo also have a significant influence. In Borneo, ecotourism has tremendous potential with the natural attractions and rich cultural traditions of the resident communities. Ecotourism can offer alternative ways to generate sustainable employment opportunities and income for the local communities, and provide unique tourism experiences, while creating incentives to protect habitat. While many challenges lie ahead, the experience from other parts of Southeast Asia shows that it may be the best way forward. In Borneo, trade in animal products and parts have been going on for centuries with China. Highly priced products like horns from the Sumatran Rhino and edible birds’ nests are in exceptionally high demand. Illegal trade in pangolin parts has decimated the population, and the Sunda Pangolin is now classified as Endangered. The latest example is the ‘ivory’ casque of the Helmeted Hornbill, which is directly carved on or cut into ornaments. Based on reports of confiscations and Asian trading websites between 2012 and 2013, it has emerged that up to 500 Helmeted Hornbills were killed every month in the province of West Kalimantan, Indonesia alone. The heads of the Helmeted Hornbills were subsequently smuggled out via Sumatra and Java to Hong Kong, China and Taiwan. For this reason the Helmeted Hornbill was classified as Critically Endangered in 2016. To make a long story short, illegal trading in wildlife is still a big problem in Borneo and the rest of Asia. There are some species in the book which will be a genuine treat for birders. The pittas, of course, are true “birders’ birds”; they’re both difficult to see and wonderfully coloured. The grip-off factor is dialled up to eleven here as all Bornean species are depicted and stunningly captured by Olesen. When you appreciate how hard it is merely to glimpse these birds, it is flabbergasting to see them photographed so beautifully. Another stand-out in this regard is the Bornean Ground-cuckoo. This species permitted only the most fleeting of glimpses when I visited the Kinabatangan wetlands in 2015 and I was grateful for that. Again though, Olesen has triumphed with some marvellous shots of the species. ....and it's not all about the birds. 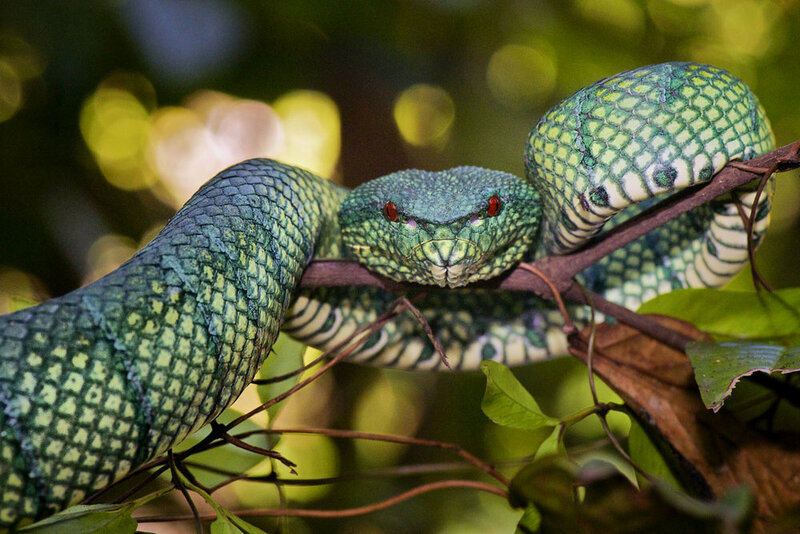 Bornean Keeled Pit Viper. Bjorn Olesen. Used with kind permission. For these birds alone, A Visual Celebration of Borneo’s Wildlife will be worth the asking price for most birders and there is much more besides to recommend it. Australian birders will find a thoroughly informative text providing an excellent foundation for birding trips in the region as well as information on all the other fauna and flora to be found on the island. Fanny and Bjorn are already working on their next large-format publishing project which I am told has a working title of Asia’s Wildlife: A Journey to the Forests of Hope. The authors tell me it visits eight different ‘forests of hope’ in eight different Asian nations and is due for publication in mid-2018. If the quality of A Visual Celebration of Borneo’s Wildlife is anything to go by the new book should be a lavish treatment of an even wider sample of Asia’s wildlife. I’ll be keeping my eyes peeled for it.